Petunia LOVES skunks! Her dream skunk is indeed, cute as the dickens, with a button nose, and darling stripes. She already has a stuffed toy skunk, but she's certain the real thing will be even better. Most of the book is her begging, pleading and promising her parents that she'd be the perfect skunk caretaker. When Petunia's parents, who remain unseen throughout the whole book, inform her that skunks stink, Petunia goes off on an epic rant, emphasized with large type that grows smaller and trails away at the bottom of the page. "With such disappointing lunkheads for parents, naturally Petunia must leave home." When she decides to run away to the woods, she happens upon a skunk, and learns first-hand the truth of her parents' warnings. Undeterred, she decides that skunks are awesome... awesomely stinky that is! What kind of pet should she get now... how about a sweet little porcupine? I loved the clean lines of the illustrations for this book. The black and white illustrations are punctuated with just a hint of purple, and an even more sparing amount of orange. The endpages become a wordless part of the story, with a skunk and a porcupine hiding in the forest. This was such a silly read. 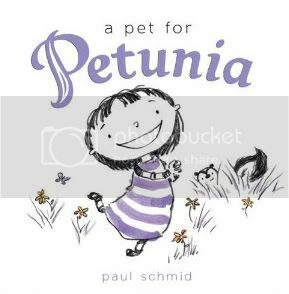 A Pet for Petunia will be a total hit at a "pets" themed storytime. With an endorsement from Maurice Sendak, it will definitely be one that you'll want to have on your shelves.